Today we are doing something little different today..Instead of usual recipe, I am sharing "My Daily Healthyish Routine" on few things I do to keep my health and wellness in check. I am intentionally using the term 'healthyish' instead of healthy because it sounds more fluid and leaves room for flexibility because every day is different and our health and wellness needs are constantly changing. My idea of 'healthy' has changed (and is always evolving) because healthy is so much more than just food and exercise....for me, healthy is finding that happy balance between physical, mental, emotional , and spiritual health. 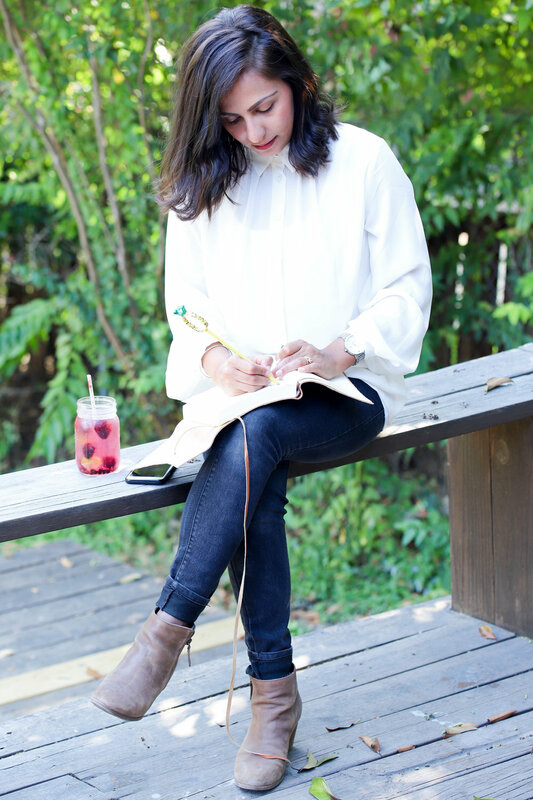 So today, I am sharing 5 key things that I prioritize to maintain my daily healthyish routine. Sleep : My alarm goes off at 5:30 am but depending on how I am feeling + what's on the agenda, I am usually up by 5:45 am - 6:00 am. On days I struggle to get up, I simply turn off my alarm & get that extra rest my body needs. Getting adequate sleep and rest is probably one of the best things I have learned to prioritize for my better health. Studies have linked sleep deprivation to many chronic health conditions including heart disease, diabetes, and obesity. Not only that, lack of sleep makes you feel tired, moody, and lack of focus in many areas of your life. How many hours of sleep one needs varies across the lifespan and from person to person but in general for young adults and adults, 7-9 hours is recommended. Here is a full study on sleep recommendations for other age groups. Meal Planning : I probably sound like a broken record but having my meals + snacks planned ahead of time allows me to eat more balanced meal (otherwise, I'd probably just eat eggs + avocado or yogurt parfait everyday). I love cooking but I also love reading, walking, napping, and mindless instagram scrolling. Therefore, having meals planned (or semi-planned) frees up my time to do other things. I typically make 2-3 main entrees (like chili, curry, or lunch-box chickpea salad), granola because yogurt parfait is my staple breakfast, and energy bites or granola bars for snacking. How to Simplify Meal Planning? I initially started meal planning to eat 'healthier' and 'be budget friendly' but now it's more a lifestyle and convenience for me. Having meals planned ahead of time has been great but I am not the one to turn down impromptu date night or decline weeknight dinner with my friends just because I have my meals planned. Multivitamin : I get asked a lot on what vitamin I take...or what vitamin should one take so this is a great time to tackle this question. By FDA's definition, dietary supplement is a product intended for ingestion that contains a "dietary ingredient" intended to add further nutritional value to (supplement) the diet such as vitamin, mineral, herb, amino acid etc. The main purpose is to help ensure that you get an adequate dietary intake of essential nutrients and in some instances, supplements helps reduce or manage the risk of a disease. I take daily MVI and omega-3 fatty acids to make sure I get all my micronutrients including omega-3 fatty acids because I don't eat enough fish or other sources of omega-3 via food. 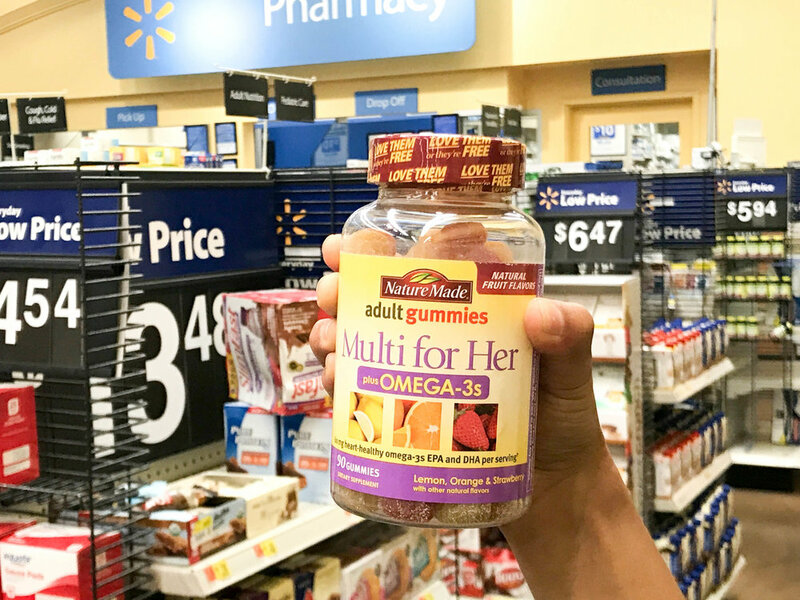 I was taking them separately until I discovered Nature Made® Multi for Her plus Omega-3s Adult Gummies - "a gummy you can trust”. 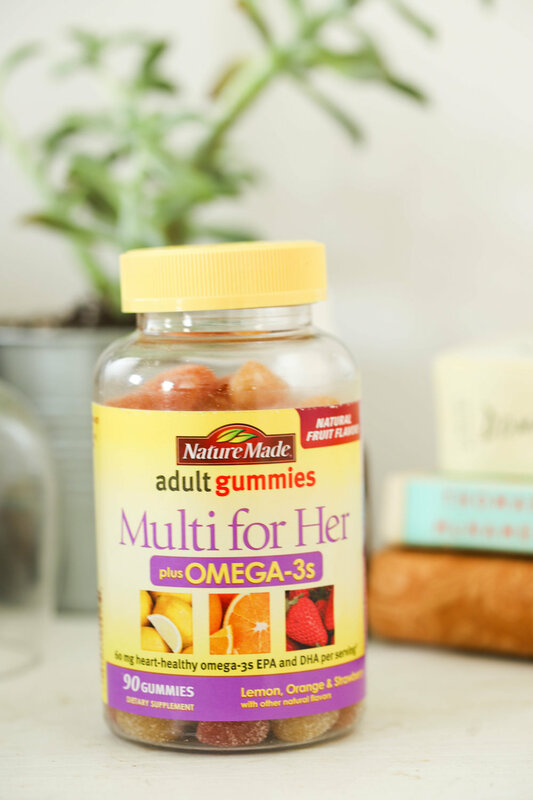 If you are looking for a daily multivitamin, I highly suggest you to try these (not just because it is a sponsored content, these gummy vitamins actually really good) + I am happy that I don't have to take additional omega-3 fatty acids. It is obviously best to get micronutrients through whole foods but that's always not possible....which is why I generally suggest a daily multivitamin. As you can see from above, Nature Made® Multi for Her plus Omega-3s Adult Gummies has a lot of vitamins that are beneficial for women† such as 100% daily value of folic acid (particularly important during childbearing years, playing a critical role in the proper development of the baby’s nervous system†), vitamin D3 (healthy bones, immune system, strong teeth†, and research is showing so much more), & vitamin C (antioxidant support† ). 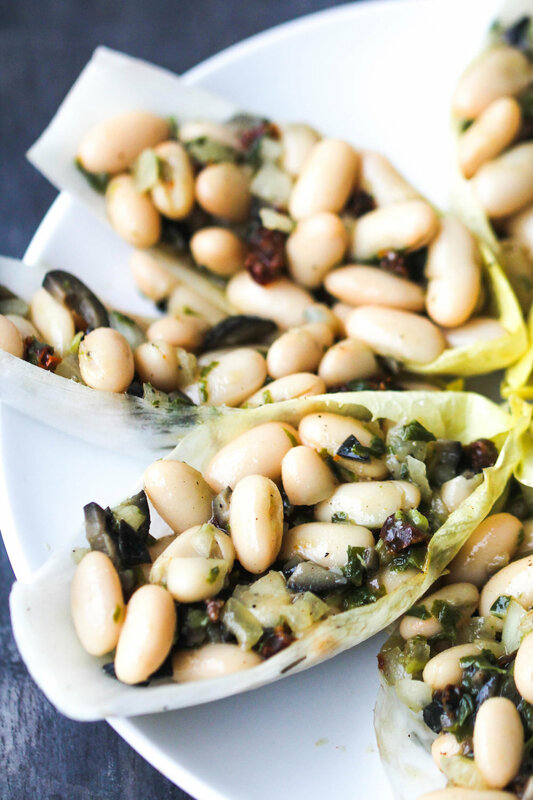 Omega-3 fatty acids are essential fats meaning the body can’t make them from scratch but one must get them from food (fatty fish, walnuts, flax seeds, leafy vegetables) or supplements. Currently, there is no standard recommendation on how much omega-3 one should get but The American Heart Association recommends healthy adults eat fatty fish at least twice per week; the World Health Organization recommends 300 milligrams to 500 milligrams of EPA and DHA and 800 milligrams to 1,000 milligrams of ALA daily from food or a supplement. However, if you have a history of heart disease, elevated triglycerides, and other health conditions, you needs will vary so please consult your doctor and/or dietitian for more personalized recommendation. When looking for supplements, make sure you look for certifications from independent testing such as USP or NSF. Nature Made® tests its gummies for purity and potency so you get the added assurance that it has the nutrients you're seeking!! 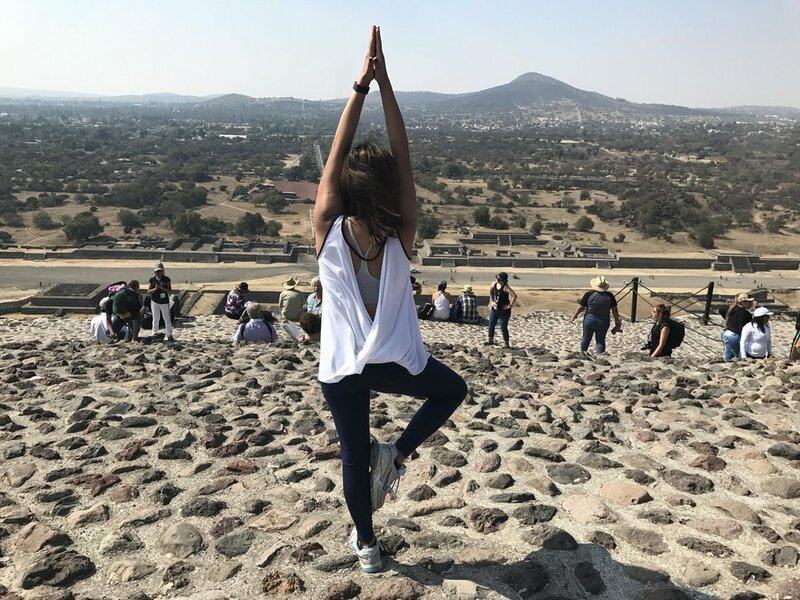 Movement : I have tried and tested different exercises in the past - running, yoga, kickboxing, indoor cycling, and walking to name a few...and I have realized that I need variety and leisure activities instead of regimented routine to truly enjoy the process. I wrote a post on "Exercise is more than a Weight Loss" and my philosophy is still the same. Being physically active improves one's health & wellbeing but it is equally important to be kind to our body and give some rest. Currently, I am loving yoga, brisk walking, and little bit of cardio in the form of kickboxing. I cancelled my gym member early last year and it's been somewhat freeing to do whatever I want. You don't need a gym membership to enjoy physical activities - look for community workouts (facebook events is a great place for that), free home workouts such as doyogawithme // fitness blender // tone it up daily workout, find a nearby trail, or rent a bike if your city has one. Self-Care : Couple months ago, I wrote a post on "Why Self-Care is a Must" & I want toemphasize that again. My idea of self-care changes every day depending on what I need that day to balance my mental, physical, emotional, and spiritual wellbeing. One day my idea of self-care could be a brisk walk in my neighborhood to clear my head and the very next day, I may want to catch up on sleep, binge on my favorite netflix series, or impromptu date night. It's not about 'being healthy'....it's about finding things to destress you and do something you truly enjoy doing. I don't like to have anything set on my calendar for self-care because then it becomes more of a chore than truly doing what I want to do...so I leave it open and let my day + feelings guide me. Most of the time, my idea of self-care is just sitting down with a cup of hot tea (or ice cream), turning off all the electronics, and doing absolutely nothing for few minutes. Healthy looks different for everyone and I want to leave you guys with this quote I read somewhere -- "Start where you are, Use what you have, and Do what you can". What are few things you do for your health & well-being?